I just used my tent for the first time (Robens Voyager 2EX), the next day it was wet from the dew. We had to pack it and drive home, after I came home I let it dry up by hanging it on a wall in the air, out of the sun's reach. I wanted to pack it, but noticed several strange spots (see picture). Anyone knows what this is and how to get rid of it? This must be your first tent. Spots are the result of tents losing their virginity! Spots of all sorts happen to all tents, one way or another, and is a normal thing. 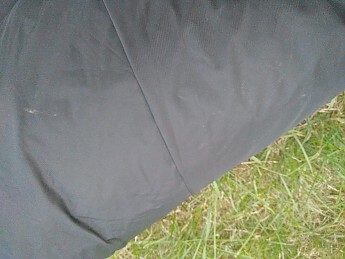 Insects and moths etc make strange spots on tents---I even see little insect chew holes on my Kerlon fly sheets---patched easily enough with McNetts silnet. That's great to hear! This is indeed my first tent and I like to maintain it well so it can last longer. When I did some research I thought it would be mildew or mold. But since that isn't the case: great! Any tips on recognizing mildew/mold and how to clean it in the right way? Or just some general tips for tents. I'm planning to take this tent on a 5-day trip in Scotland, so any advice is welcome! Best way to avoid mold/mildew is to unfurl the whole tent wad and hang it out in a big area like a garage on a couple laundry lines so it's off the ground and completely suspended and spread out to dry---both the fly and the inner tent. But how do I recognize it, since this isn't mildew right? If you are concerned about using chemicals just grab an old rag, some water and rub. Mild soaps should be fine on most fabrics but you can also get some special technical washes. Everything I have is dirty, broken, ripped, stained, etc... I knock off the big chunks of dirt and patch holes to stay water tight but I don't sweat the rest. Yeah, Patman is right. All my gear is expendable and even my expensive tents. I consider boots and sleeping pads and socks and most everything replaceable and use everything fairly hard. I also like to replace items before they need to be replaced---a sort of precautionary purchasing policy. I've never cleaned a tent (or tarp), other than to wipe off bird poop. I just hang my tarps, hammocks, etc on the clothes line after a trip. When I hike, I usually take a midday nap. If I put gear away wet, I'll spread it out on the ground or hang it on a tree branch to dry. I've never had a mildew problem using this technique. To answer your question, how to recognize mildew, it is dark colored, is inside the fabric and has a horrible smell. Often the smell is noticeable before the stain is apparent. But a couple days wet and then dried out completely isn't going to cause it. It is more likely to come from something put away for a long period of time when it is a little wet. "Yeah, Honey, it's a Precautionary Purchase. After all, you don't want my 'old' mattress to fail in the middle of a trip do you?" Easy fix to take care of your investment (regardless of how much you spent) - after each use, wipe down the inside and outside w/a damp paper towel; then just set the tent & rain fly out (on a sunny day) to make sure all sides are dried. Down the road, consider using Nikwax's Tent spray to help retain/restore the water repellancy of your tent. I guess you folks didn't get the memo on limiting conversations regarding PPP and other man cave wisdom to face to face verbal, or secure phone lines. Don't be publishing the ruse we use to upgrade gear for the heck of it. If my wife ever catches wind of this post, she'll most likely make me give away all my swell upgrades and force me to use that perfectly "good" 9 pound canvas pup tent sitting somewhere in the garage. Thanks for the useful answers, DrPhun and dlm! PPP is definitely not an option since I'm still studying. 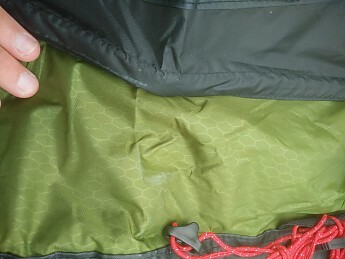 This forum: Older: Tent pitching tips for keeping gear healthy Newer: Adding Waterproofness to Silnylon Tent Floors.